MADISON, Wis. — DNA and the genome, we know, provide the blueprint for life. But it is the proteins made according to the genome’s instructions that are the nuts and bolts of living organisms, providing the molecular building blocks for all cells and that are critical targets for therapy. There are many different kinds of proteins that make up the human body and they are widely studied. But scientists have been hampered by their inability to easily analyze some proteins that are difficult to solubilize in water. This is especially true of proteins that reside in the membranes of cells and which have the most potential as new drug targets. In a study published today (April 15, 2019) in the journal Nature Methods, a team led by University of Wisconsin-Madison associate professor of cell and regenerative biology and chemistry Ying Ge reports the development of a novel strategy capable of extracting and driving hard-to-reach proteins into water solution where they can be effectively studied using mass spectrometry, a powerful analytical technique. The new approach promises a trove of biological insights and, importantly, may help identify therapeutically relevant proteins and provide new disease diagnostic techniques. Moreover, as proteins undergo change due to things like aging, disease or even therapy, they can provide clues to the courses of diseases or conditions, providing further insights into changes occurring at the molecular level. Scientists have developed a variety of methods for studying proteins and technologies such as mass spectrometry have evolved to the point where researchers can measure the molecular weights of protein molecules accurately, revealing details in the protein sequence and modifications that will help the design and discovery of effective new drugs. But scientists must first extract proteins into a water solution from cell or tissue samples by using surfactants, detergents. 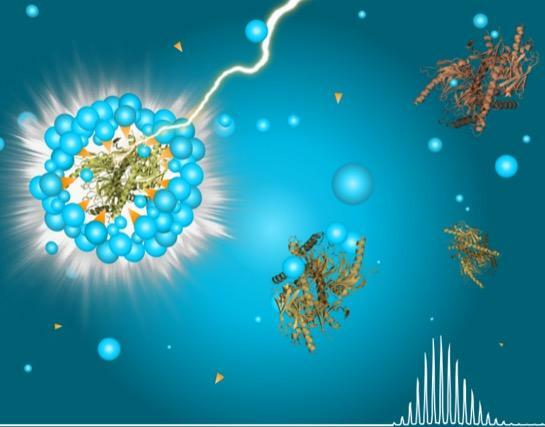 However, conventional surfactants can interfere with mass spectrometry analysis of proteins as they overwhelm the signals from proteins in mass spectrometers. Ge’s team sought an agent that met three key criteria: It needed to be water soluble and rapidly degradable; it needed to be a strong surfactant; and it needed to be compatible with whole protein mass spectrometry. To help extract membrane proteins from cells and tissues for analysis, Ge and her colleagues, including lead author Kyle Brown, a UW-Madison graduate student, postdoctoral fellow Tania Guardado, and chemistry Professor Song Jin, designed and screened a large number of chemical compounds and identified one that could be molded into a “photocleavable” surfactant called Azo. Azo, notes Ge, functions much like conventional surfactants except that a chemical bond that can be broken by simple exposure to ultraviolet light is added to the middle of the surfactant molecule. When the bond is cleaved by exposure to light just prior to undergoing mass spectrometry analysis, Azo breaks apart, leaving only the protein molecules and eliminating the detergent that interferes with the ultrasensitive analysis. This is the first time such engineered molecules with photocleavable bonds have been utilized in whole protein analysis. Notably, Azo can be easily synthesized and can be used as a replacement for the most commonly used surfactants. The Wisconsin Alumni Research Foundation has filed patent applications on the new technology. This research is supported by National Institutes of Health R01 GM117058 (to S.J. and Y.G.). Y.G. acknowledges R01 HL109810, R01 HL096971, R01 GM125085 and S10 OD018475.